Saucer Time! 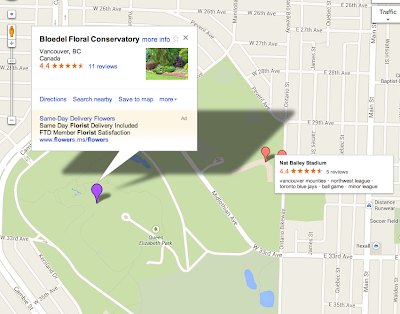 : UFO Sighting at Nat Bailey, Vancouver, Canada: Is It Real? UFO Sighting at Nat Bailey, Vancouver, Canada: Is It Real? A video has surfaced on the internet recently of what appears to be a UFO hovering over Nat Bailey baseball stadium in Vancouver, Canada. The source: a Youtube account by the name of Jason Fuller. I thank Jason Fuller for uploading this video footage, but I have a few questions about it. My first question is, why is the video so short? I filmed three red glowing objects ( I don't believe they were extraterrestrial though) back in June and I stayed on the objects till they burnt out. This is one of the important characteristics that helped me determine they were probably just some type of red flare. If Jason's video camera was running out of batteries than that is understandable. My next question is where did the UFO go? Did it shoot away or did it stay there for the remainder of the game. The movement of an unidentified object is so important. It basically can determine what the object might be. After going down the list of plausible answers of what a UFO might be and still are left with none, than that is when a UFO might start moving in to the extraterrestrial category. One thing is for sure, the video does not seem to be a video hoax. Whatever was there, was actually there because another baseball fan caught the same UFO on video with their cell phone. In this second video, the woman filming asks, "Do you know what that is?" and the voice of a man next to her seems rather calm in explaining some options. One of those options is a restaurant in the distance. He doesn't seem to be as perplexed by the object which leads me to believe the UFO must of not been making any shocking, irregular, movements. 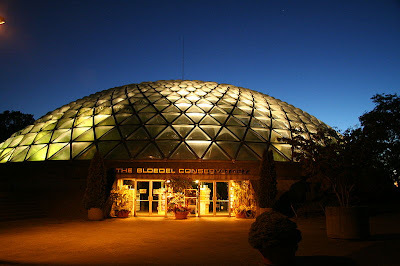 A Youtube user commented that the Bloedel Floral Conservatory is not far from the Nat Bailey Stadium and maybe it was the lights from the conservatory being mistaken for a UFO. The conservatory does have a rather Space-y architectural design to it. It's hard to say if the UFO was a real UFO or not, but whatever it was, it seemed to be rather uneventful. The UFO seems pretty stagnant in the videos and, is it just me or, do the baseball fans seem way more excited about the game than the strange lights floating near the stadium? A Canadian newspaper even had fun with it, using the UFO in its sports headline. 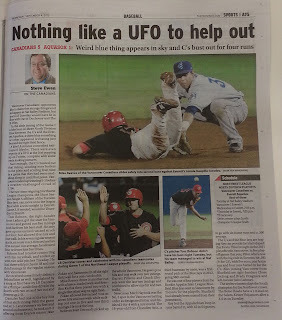 A twitter tag #luckyUFO even made its rounds on Twitter as some Canadian sports fans believed the UFO helped their team win! I'm keeping up to date on the Vancouver UFO sightings thanks to, Vancouver UFO Sightings, of course!